The final version 1.0 of Flock tells us that this browser that look stylish is not just another competitor to Internet Explorer, Firefox and Opera, but something different: a specialized tool for the social Web. It provides easy access to Facebook, Twitter, FlickR, Youtube, Blogger, Wordpress and other sites of the blogosphere. Update April 13, 2011: The Flock browser is no longer supported by the team that has stopped all development and which recommends turning to Chrome or Firefox. But we can also add RockMelt, closer in spirit to what Flock was. It's blogs and the blogosphere, social networks with sites of profiles and relationship as Facebook, and sharing of photos and videos. Flock make them its specialty, it natively integrates all the functions of social network and makes access to them intuitive and immediate. The exchange of photos is done by copying and pasting between your site and the sharing site! 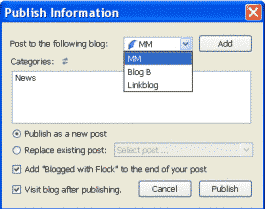 Similarly with your posts through the blog editor. The weakness of blogs is in online publishing tools with the BBCode or equivalent, and when you want to incorporate a wysiwig editor working with buttons as word processors, it is quite cumbersome and slow to use. An alternative solution is to have the editor on his computer and communicate with the blog software. This was done with Live Writer from Microsoft, and this has caused a real enthusiasm, as well as Air Adobe. The success of these programs encouraged to create an alternative based on Gecko. It interfaces well with a collectively hosted blog site as Wordpress, Blogger, Livejournal and others, or with your own site powered by a CMS for blogs. The editor can be used to insert images by cut/paste, as well as videos. To be able to edit his hosted blog, one have to connect to the site where the identity must be confirmed, and the browser automatically interfaces with the software. It is compatible with the Movable Type blogging, Metaweblog and ATOM APIs. The mediabar will contain photos and videos taken at the sharing sites as Youtube. A pull-down menu allows you to select a site and a category as for example the latest videos submitted, and these videos instantly fill the mediabar where they can be retrieved, and if you like, displaced to a post in his blog. The mediabar justifies alone using Flock! To add a feed, the simplest way is to go to the site and click on the orange icon symbolizing the feed. It is proposed to subscribe while the feed is displayed, and it can be added to the left panel in Flock. It works as the bookmarks panel, click on a link to see the feed. - Screenshot allows you to save a Web page, in full or in part, in the form of an image file. - KeyScrambler encodes keystrokes, including codes and passwords, to prevent spyware to record and reproduce them.